One Racer’s Road To The Leadville 100 MTB. 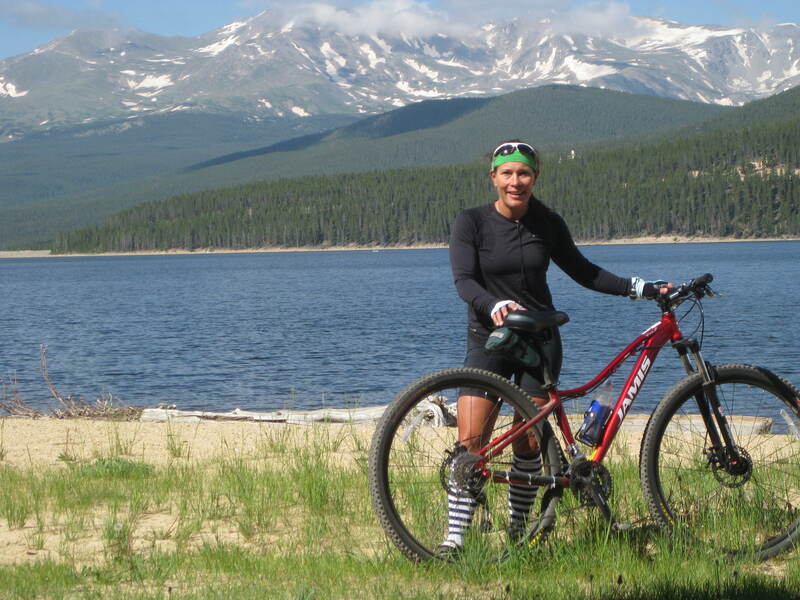 This is a guest blog post by Dawn who shares her experiences training for her first Leadville 100 MTB in 2011. She will also do a post-race recap after her second race this weekend. In 2010, a friend came to town and suggested we hit a cool bar. While that would have been fun, I recall (dragging) persuading him to a showing of the 2010 “Race Across the Sky”. While we missed half the movie due to technical difficulties with the live feed, I was still seriously hooked. The next day was the first day of the lottery for LT100 and I can still see myself sitting in my study, hitting “submit” on the entry page. Worst case? I’d be out $15. Even worse than that? Holy s*%t! What if I got in?! Well, February 28 2011, the confirmation email came. My first welcome to the LT100 was via a receipt from Lifetime Fitness, confirming that my Amex had been charged. Before that day I had, at most, ridden 25 miles on a mountain bike. I had raced a season on my road bike and ridden the Harpoon Brewery-to-Brewery 148 mile ride a few times, but 100 miles on a mountain bike? At 10,000 feet?… again, expletives were the only words that came to mind. Again, what have I really gotten myself into?!?! Once I got the confirmation I got serious pretty quickly. Luckily, I had a pool of friends, who like me, love talking gear and training. The upside was I had a wealth of folks to tap into for advice on how to best tackle Leadville; the downside was I had a lot of advice to sort through, not too bad all things considered. To solve for the training program I went to trainingpeaks.com and to figure the nutrition part out I scoured the internet and grilled my friends on their go-to race food favorites. From there it was trial and error, with lots of error – which I’m still unfortunately paying the price for. Because I’m somewhat ‘cheap’, and refuse to throw anything out, I’ve found myself using my “error” foods on shorter rides up to a year post-purchase. I can definitely say that choc blocks and other energy chews taste better when they’re not the consistency of Mike and Ikes. What I did net out at nutrition-wise was a healthy mix of Perpetuem tabs, chocolate and peanut butter GU gels, orange and lemon-lime shot blocks for solid foods and a mix of Clip 2L and IronMan Perform for my liquid diet. I also cannot say enough about oranges, bananas, and if you’re lucky enough, a PB&J or ham and cheese sandwich from your support crew at critical times. Cutting to the chase I trained like mad. My fear of riding 100 miles, at elevation, had me stick to my 20-week training program without missing any workouts. I dialed in my nutrition during the long 5+ hour endurance rides. A few days before the race I was lucky enough to meet Leadville’s six time winner David Weins. The advice he gave was that if you have the fitness and the nutrition down, then those two things along with the mental stamina to stay focused will absolutely help you get to the finish line. And with that I was ready race and I buckled!! 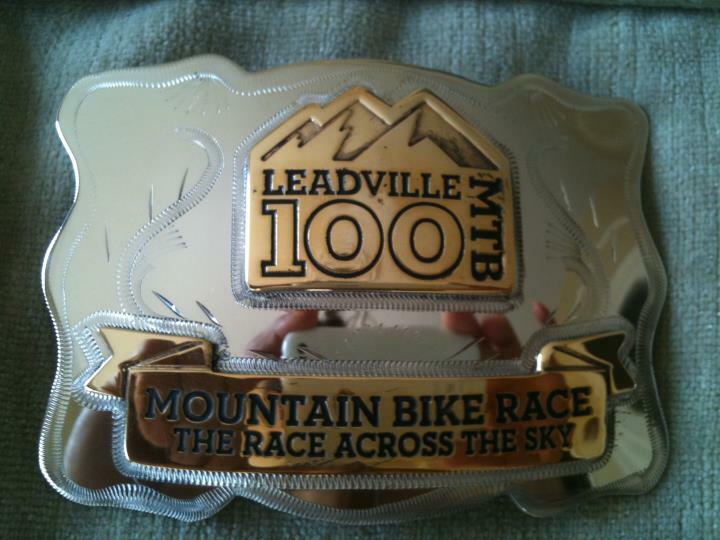 (For those not in the know, any finisher who completes the course in sub-12 hours gets a silver Leadville 100 belt buckle – pictured above). I finished 80 seconds of 12 hours and could not have been more ecstatic!! It only took 24 hours post race for me to reconsider racing Leadville again. But deciding to race and getting in are two very different things. In November of 2011, I was in the same position as a year prior, submitting my entry and keeping my fingers crossed. In February, 2012 the confirmation came again and the same thoughts crossed my mind – oh my god! I’m back at it!!! I’ve trained hard again and I’m ready for this weekend’s race. Stay tuned for a race recap! Dawn lives in Boston, MA where she works in digital marketing. Despite the fact that she’s had seven knee surgeries she tries to stay as active as possible. She has a passion for road cycling, mt. biking, skiing (and just about anything outdoors) and hot yoga. She’s been a certified spin instructor since 1998. She also rowed (club sport) crew at the University of Michigan. In 2011, Dawn finished the Leadville Trail 100 Mt. Bike race in 11:58:39, earning a silver belt buckle by a mere 80 seconds. She hopes to finish with a little more breathing room in 2012. She’s also challenged herself to a personal quest of doing at least one cartwheel a day until she turns 80. Inspiring story. Kudos to you for making such a strong committment. Previous post: Dear Dumbbell: Do Clean Eaters Smell Lemony-Fresh? Next post: What Should I Eat On Race Day?